THE WORLD ACCORDING TO GARP (1982) - Warner Bro. (Academy Award nominee) - Director George Roy Hill commissioned Canemaker to design and direct two sequences for the film adaptation of John Irving's best-selling novel. Designed in the manner of children's crayon drawings, they were intended to express the imaginative life of the child Garp. The first sequence, a fantasy of flying, underscores the young Garp's emotional bond for the father he never knew, an airman shot down in World War II. In the second sequence, Garp overhears his mother, a nurse, explaining how he came to be conceived when she took advantage of the opportunity presented by a dying aviator who could only speak one word, "Garp." A pencil test of the animation was included in preview screenings but deleted from the final cut because its humor drew attention away from the character of the boy. "The movie introduces a lighter touch, and there are some expressive pictorial inventions . 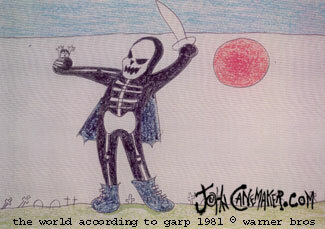 . . including a brief, deft animated sequence by John Canemaker in which one of Garp's boyish drawings springs to life." The Washington Post, 23 July 1982. "Garp's artistic side, described so overbearingly in the novel, is presented sweetly and playfully; there's an animated segment of crayon drawings as the child Garp tries to imagine what became of his father . . . it helps make Garp's much-praised talent seem believable." New York Times film review, 23 July 1982. See also: "Animated About Part in 'GARP,' by Charles Solomon, Los Angeles Times, 22 Dec 1982; "Strictly Personal" by Liz Greene, Elmira Star-Gazette, 3 May 1982; Variety, 21 Oct 1981, "New York Sound Track."